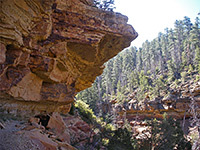 There are two short, easy trails near the southernmost overlook on the North Rim of the Grand Canyon (Cape Royal) - the level path to the actual viewpoint and the half mile route to Cliff Spring, where water continually drips from the ceiling of an alcove at the edge of a narrowish, forested side canyon, forming a few shallow pools and supporting an area of moss, ferns and other green plants. The spring is not particularly special but the view down the canyon is quite nice, allowing a tantalizing glimpse of distant red cliffs towards the wider Grand Canyon, and the trail makes a good diversion of around 40 minutes, round trip. The trail has an inconspicuous sign and a small parking area, enough for about 5 cars, in a layby along the highway across the Walhalla Plateau to Cape Royal - 22 miles from the North Rim visitor center and 0.4 miles before the road ends, just as it dips in and out of a small but steep-sided valley. 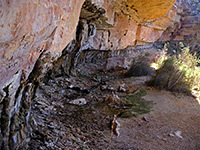 The path leads further down this wooded ravine, first passing the remains of an ancient Anasazi granary, ingeniously built under an overhanging boulder, though the structure is difficult to inspect properly as the ruin is partly hidden behind a huge 'No Touching' sign. After a few minutes, the valley joins a slightly larger drainage, actually the far end of a shallow wash running for 8 miles across the Walhalla Glades, where the path turns left, crosses the streambed and follows a ledge on the north side all the way to the spring (the creekbed to the right forms part of the off-trail route to Honan Point). The rock beside this ledge has eroded sideways more then the layers above and below, creating an overhang of 15 feet or so. 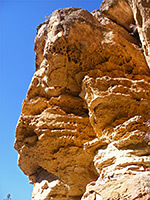 On the left side, the canyon is now bounded by sheer, buff-colored walls of Coconino sandstone and soon becomes rather deep, dropping far below the level of the path until it meets the main canyon rim 1/4 mile further, where it tumbles many hundreds of feet over the Supai layer, eventually joining Clear Creek. Cliff Spring is a cool, shady place, permanently moist, though the water soon seeps below ground, and most of the ravine is usually dry. The trail continues a little way beyond the water, fading away as the ground becomes too steep to continue. Views to the south include Wotans Throne, the South Rim near Grandview Point, and even the distant San Francisco Peaks near Flagstaff.